Stars: Louis Ashbourne Serkis, Dean Chaumoo, Tom Taylor, Rhianna Davies, Angus Imrie, Rebecca Ferguson, Patrick Stewart, Denise Gough, Noma Dumezweni. The mythology of King Arthur has provided the spark for many films, ranging from the musical Camelot through to the animated Disney film The Sword In The Stone to John Boorman’s Excalibur through to (shudder) Guy Ritchie’s awful recent King Arthur. Now the mythology gets a contemporary makeover with this family friendly fantasy from writer/director Joe Cornish (Attack The Block) which is a wonderful throwback to those great 80s adventures featuring kids on a mission or a quest. Twelve year old Alex (played by Louis Ashbourne Serkis, son of motion capture actor Andy Serkis) lives with his single mother (Denise Gough) and likes to hang out with his nerdy best friend Bedders (Dean Chaumoo). Alex is constantly bullied at school by Lance (Tom Taylor, from The Dark Tower, etc) and Kaye (Rhianna Davies). Trying to outrun the pair one evening after school Alex hides out in a construction site. There he spies an old sword stuck in a concrete block. He pull out the sword, but that somehow awakens Morgana (Rebecca Ferguson, from Mission: IMpossible Fallout, etc), Arthur’s evil and manipulative sister. Morgana plans to use the sword to regain her magical powers and enslave all of Britain during an upcoming solar eclipse. 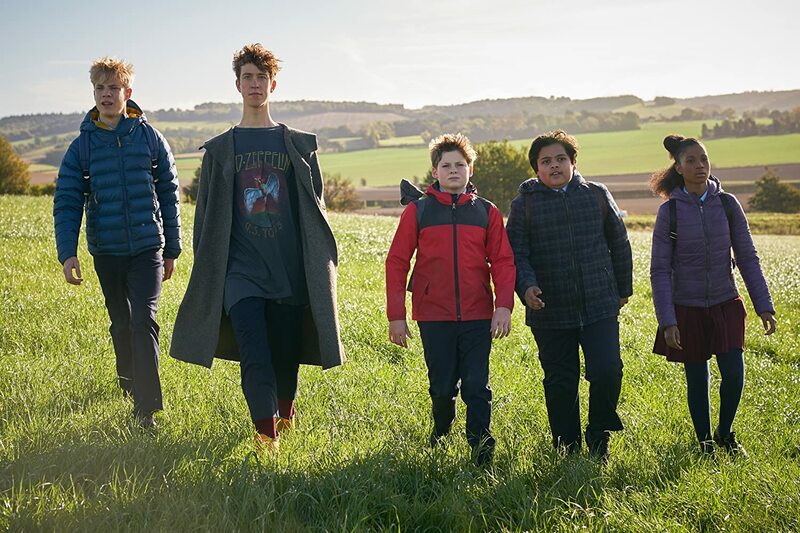 Alex finds an unusual ally and mentor in the form of the legendary wizard Merlin, who turns up at school in the form of the gangly Mertin (played by Angus Imrie, son of actress Celia Imrie). Merlin schools Alex and Bedders in the art of being a knight and trains him to defeat Morgana and thwart her plans. Alex and Bedders also recruit Lance and Kaye into their little army. They fight off flaming undead horsemen summoned from under the ground by Morgana. The climax of the film sees Alex turn his high school into a booby trapped battle ground. The wonderful animated opening sequences tells us of the familiar story of King Arthur, the magical sword Excalibur, the magician Merlin and the evil sister Morgana. Cornish takes a few liberties with this familiar story – for example the names of Alex’s friends loosely correspond with those of some of Arthur’s famous knights of the round table. The Kid Who Would Be King tells the Arthurian legend with some new beats, making it seem relevant to today’s troubled world and its increasingly divisive politics. Cornish delivers some positive messages about how today’s adolescents are the future of the planet and have the power to change the world and make it a better place, and he reminds us that inside every adult there is a child, while some children have the wisdom and courage of an adult. However, the film does seem a little long. A subplot involving Alex’s futile search to find his missing father leads nowhere and only serves to stretch the running time to beyond two hours. And some of the action and training sequences become a little repetitive. Also some of the CGI effects that create the flaming horsemen are a little clumsy. Serkis brings a kind of nerdy charm to his performance as Alex, who is obsessed with the Arthurian legend. Imrie provides plenty of humour through his character, especially when he transforms himself into an owl and utters his dialogue in a pompous fashion. And Patrick Stewart pops up as an adult Merlin, sporting a Led Zeppelin T-shirt and clearly having a bit of fun. Ferguson is under used and given little to do as the evil Morgana. Thankfully though The Kid Who Would Be King never takes itself too seriously and will entertain and amuse its target audience.